Definitely, this is an awesome picture but is it really a message from heaven? Is this striking image of majestic man wearing robes God? You be the judge. I realize that some may see this as a sign, an act of God if you will. There will be others, those who will doubt. And that's okay. But one thing's for sure, and that's how remarkably clear this image in the sky really is. Believe it or not, God is said to work in mysterious ways. Regardless of your belief system, it's your God-given right to judge this photo for yourself, isn't it? So, I ask you is the image above just a group of cumulus clouds? Or are those noticeable clouds with clearly defined edges the Almighty himself? Still, no matter the answer, lots of us will continue to look to the sky, searching for life's deeper meaning. Or are we searching in vain, deluding ourselves while involving our senses that random images are actually miracles or signs from above? Why do we look to the skies above in relation to God? Sure, as children we stare at the sky and see shapes appear in the swirling clouds but as adults some of us look upwards reaching for a higher power. Are we waiting for signs? Or proof of God? 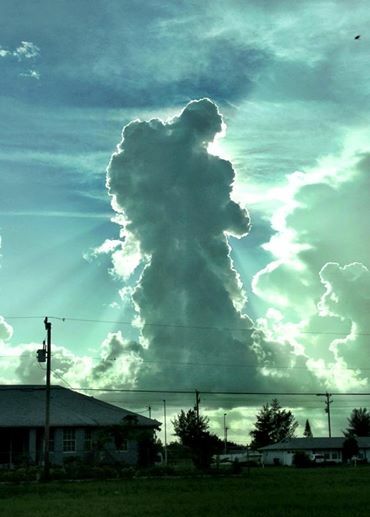 I for one was blown away by this photo and yes, I believe it's a real snapshot of God in the clouds. Although personally, I'll admit it is hard to digest this image as I am living a hell-on-earth type of life, wishing daily that I didn't feel so hollow, so broken. I was raised a Catholic, so sure I believe in God -- but lately, I have to wonder how much he really believes in me, or my family. God only knows why I was one of the first to see this photo. And since I believe that he made me human, I believe he won't condemn me when I behave like one. That said I've spent my fair share of time blaming him for my actions and inactions. Yes sir, I've projected my fears, insecurities, and failures onto Him. Blaming God has been easier than blaming myself. Okay, I'm sure you're thinking that's not the typical reaction of someone who just seen God manifest himself in the clouds. But God forbid in these turbulent times anyone of us gets real? You know raw, I have -- by opening up my life, my struggles, and my insecurities with my story. Although, I still struggle with what I'm doing here on this planet and why there's so much unfairness and evil in this world. Still, I do see this picture as proof that God is speaking to all of us. So who among us is willing to listen? Please share your opinions below. I'd love to hear them. Fiona Finn, author of Raw: One Woman's Journey through Love, Loss, and Cancer. Feel free to follow me, or follow me not on Twitter @fionaburkefinn.